In this article we will incorporate upward transitions from a jog/trot to a halt and the upward transition of the halt to jog/trot in the pattern. I’ll explain the aids the rider should use to keep her horse “straight” on the circles. I’ll conclude with some tips on how to improve communication with a horse that does not have complete knowledge of the rider’s aids. We will use the same Circles-Within-A-Circle pattern I described in my last article. 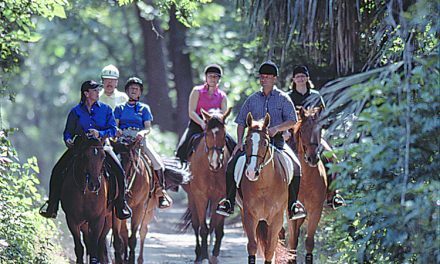 With the horse properly tacked and warmed up, ask him for a nice comfortable, natural walk on a large circle to the left. Remember to communicate your request to move forward, by using the aids together in the proper sequence: seat-legs-hands. As you approach either the 3 o’clock or 9 o’clock position, turn your horse on to the smaller circle within the larger circle. As you do this, keep your inside or left leg “on”. By this I mean the leg is in light contact on the horse’s barrel at the girth. Lightly turn the horse using the outside (right) leg and rein. The horse’s head should be lightly positioned toward the direction he is moving on the circle. His head and neck should not be overbent toward the inside nor cocked to the outside. Allow the horse to carry his head in a natural position. Do not worry about a head set at this point! When the horse is properly positioned on the circle, prepare for an upward transition. Increase the weight in your seat, through the relationship of your shoulders to the seat. Following the horse’s movement with the hips, give a light squeeze with the legs and open the fingers. You should get a nice smooth transition to the jog or trot. If you do not, check to make sure the horse is properly positioned and that you have used the aids correctly. Continue on the large circle at an easy jog/trot. As you approach the 9 o’clock position, turn the horse on to the smaller circle. Use the smaller circle to prepare for an extended jog/trot because it will help you organize the aid sequence. Try to time the aids sequence so that the horse will be doing an extended jog/trot as you close the small circle and resume the pattern on the large circle. As you complete the first half of the small circle, put more weight in the seat and follow the horse’s movement with the hips. Relax, breathe, and get looser in your body. This will allow you to follow your horse’s motion. 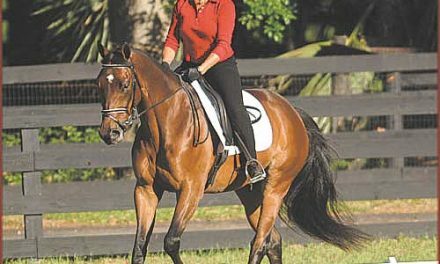 Apply slightly more pressure with your legs and open the fingers slightly to allow the horse to go forward on continue on the larger circle at the extended jog/trot. When you are ready to decrease speed, turn off the large circle on to the smaller circle. Put more weight in your seat and slow the motion of your hips. Keep the leg on contact to maintain some forward movement otherwise your horse might stop in response to your seat aids! There should be little to no closing of the fingers. Just use them to keep the horse lightly positioned on the circle. The horse should give you a smooth downward transition. Here’s how to use the “circle” exercise to respond to your aids to make a transition from a jog/trot to halt. Establish a jog/trot on the large circle. When you are ready to practice the halt, start by bringing the horse on one of the smaller circles. To communicate the downward transition, put more weight in your seat. Keep both legs on contact with a light pressure on the horse, but not squeezing him forward. 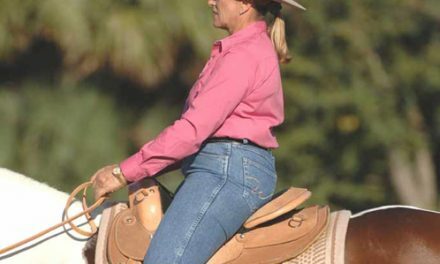 With seat and leg aids active, close your fingers and the horse should halt. If you can, try timing your aids sequence so the horse halts at the point where the smaller circle meets the larger. The opposite transition, from halt to jog/trot, presents a greater challenge since you will be asking the horse to go from a stopped position to a much more forward gait. This transition requires a lot of energy. With the horse stopped at a halt, put more weight in your seat and be ready to move your hips to support his forward movement. Avoid excessive squeezing or kicking to get a reaction. Instead use a “cluck” to ask him to move forward. When he does, move your hips with his movement. Open the fingers to allow him to go forward. If he gives you a few steps at the walk before trotting, don’t make a big deal about it. Use the pattern I’ve given you to improve the transitions until your horse understands what you are trying to tell him with your aids. 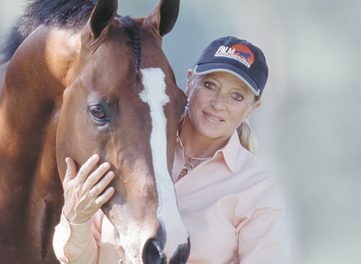 What if your horse does not have any knowledge of how to respond to the rider’s natural aids? Then you should not use the seat, leg, or hand aids right away. Use your voice as an aid instead. I always start my horses with ground training. I incorporate voice aids into ground training so my horses have a basic knowledge of the commands I will give them undersaddle. Horses don’t understand words, but they recognize tones of words. A deep tone means “respect me” or “respond to me”. A mellow tone of voice is a reward or will relax the horse. 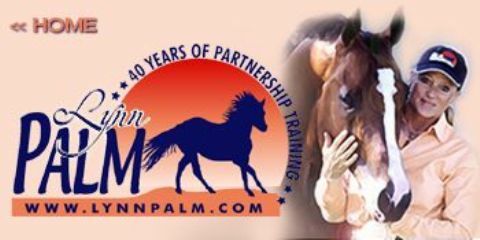 If a horse has no knowledge of the aids, I will use voice instead of my hand or leg aids to easily allow the horse to achieve an understanding of them. Here’s an exercise I use to help a young or inexperienced horses understand my aids. It is done on a medium sized circle. The horse should be standing on the circle. To teach him the concept of walking forward in response to my aids, I will give him a command in a deep voice to WALK or WALK ON, and reinforce it with a “cluck” if needed. The deeper tone means “respond to me”. I will not use any leg aids, but will support his willingness to obey my request by following his motion with my seat and hips and allowing him the freedom to move forward with my hands. I will use very little to no rein aids to slow him, but only use them to guide him on a circle. After he walks on for a few steps, I will ask him to slow down. To do this I will use a lighter, soothing voice command of EASY. I’ll reinforce my request by stopping the movement of my seat and hips. As he slows and shows he understands, I’ll once again give him the command to WALK ON and increase movement in my seat and hips to follow his forward movement on the large circle. To ask the horse for an upward transition from walk to trot, I follow the same procedure. I will ask him to WALK ON in response to my voice command, reinforced with my seat aids. When I am ready to trot, I’ll use a deep tone of voice to say TROT, use my seat to support his forward motion, and very little rein aids except to keep him on the circle. Trot around the circle several times, then prepare for a downward transition to the walk. Without pulling back on the reins, use a deep voice tone to say WALK, sit deeper in the saddle, and stop following his motion with your hips. He should make the downward transition to the walk. When he does, allow him a few steps at the walk then ask him to jog/trot again. Bring him on to the smaller circle and ask him to halt using the voice command WHOA. Praise him when he does. Whenever you get a good response from your horse, remember to reward. Practice these exercises in the opposite direction. When training a horse that has very little knowledge to no knowledge of the aids, continue working this exercise using your voice aids, reinforced with your seat, until you get good responses. When he shows that he understands, gradually add the leg and hand aids and eliminate the voice. By starting with simple, easy-for-the-horse to understand voice aids, you will build a foundation for him to want to learn more later.